“The all-new Crowne Series for 2014 takes the Harris FloteBote flagship to the top of its class.” So states its website of the newest edition to this Fort Wayne, Indiana builder of pontoon boats for over fifty-five years. The Crowne 250, the only model in this series, comes in three floorplan configurations and joins a total of twenty models in six series from seventeen to twenty-seven feet comprising almost a hundred floorplans in total. All three floorplans of the Crowne 250 include fabulous dual rear-facing loungers at the stern, a helm station, and two facing bow area lounges, the starboard lounger ahead of the helm being a comfortable four-seater while the port side lounger is a shorter three-seater to allow for the port side entry gate. There are also entry gates in the centre of both the bow and the stern for a total of three. The first and standard floorplan designated the 250 DL (for Dual Rear-Facing Loungers) includes a two-seater lounge on the port side opposite the helm. The second floorplan, 250 DLDH (for Dual Rear-Facing Loungers plus Dual Lux Helm Seats) replaces the two-seater lounge opposite the helm in the DL with a second matching helm seat. The third floorplan, 250 DLEB (for Dual Rear-Facing Loungers plus Entertainment Bar) replaces the two-seater lounge opposite the helm in the DL with an L-shaped, two-tiered refreshment centre with sink, freshwater tank, wine storage cabinet, stainless steel drawers, and optionally available stainless steel refrigerator. 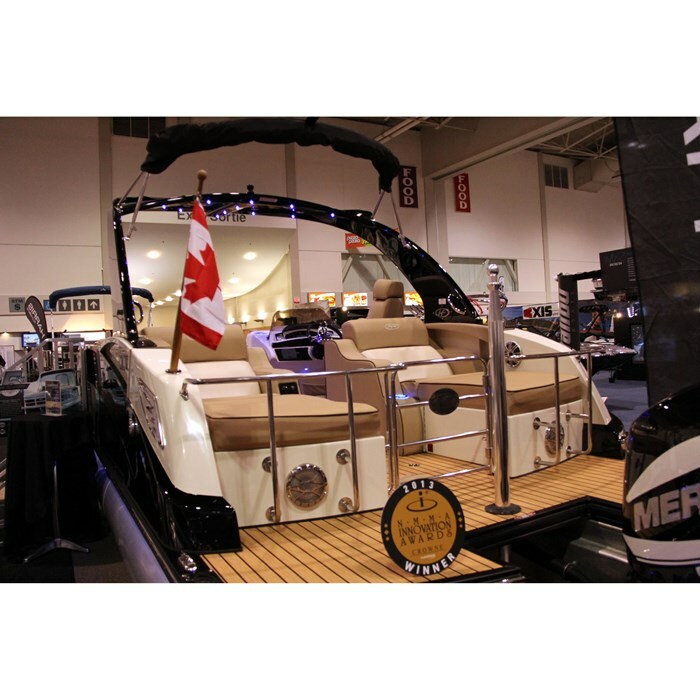 Two trendy low-back, floor-mounted pedestal seats are conveniently located just ahead of the port side rear-facing lounger at the back of, and for use at this refreshment centre. With this Crowne 250, Harris says it was striving “to provide an innovative, distinctive luxury pontoon that is virtually unlimited when it comes to customization.” Let’s explore this further. 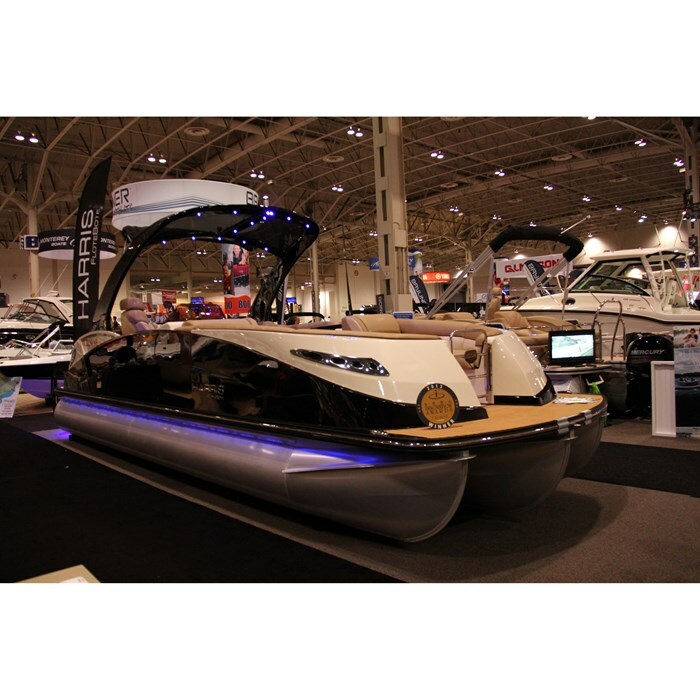 At first glance, the Crowne 250 doesn’t even look like a typical pontoon boat with its swoopy curved and contoured exterior of fiberglass panels with a radiused bow and upholstery on the interior surfaces. 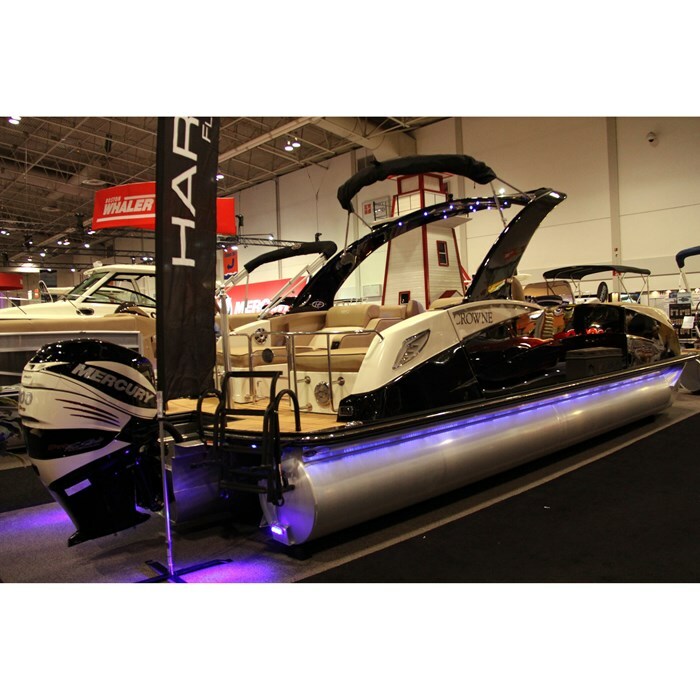 Even the vinyl covered bow deck and large swimdeck with 5-step fold-down ladder continue this rounded look. Stainless steel docking lights with integrated LED accent lighting are standard as are flip-up cleats and stainless cupholders. The molded fiberglass helm with removable windscreen features a cross-stitched, vinyl wrapped Euro tilt steering wheel, lockable glove box, and analog gauges including even an hourmeter and digital depthsounder. The captain is pampered with a highback, UltraLux recliner. Standard flooring is Cognac carpeting. A soft-sided cooler is standard as is a bow area woodgrain table, a foldaway change room with curtain, a 12-foot bimini top, quick-release fenders, and even a mooring cover. Standard entertainment is provided by a Polk stereo with Bluetooth and USB capabilities with six Jensen speakers. One of the most notable options is a power-folding sport arch with integrated bimini and LED lighting and an aft-facing camera if you so choose. You can upgrade to a teak top on your entertainment bar and choose a matching folding and height-adjustable teak articulating table. 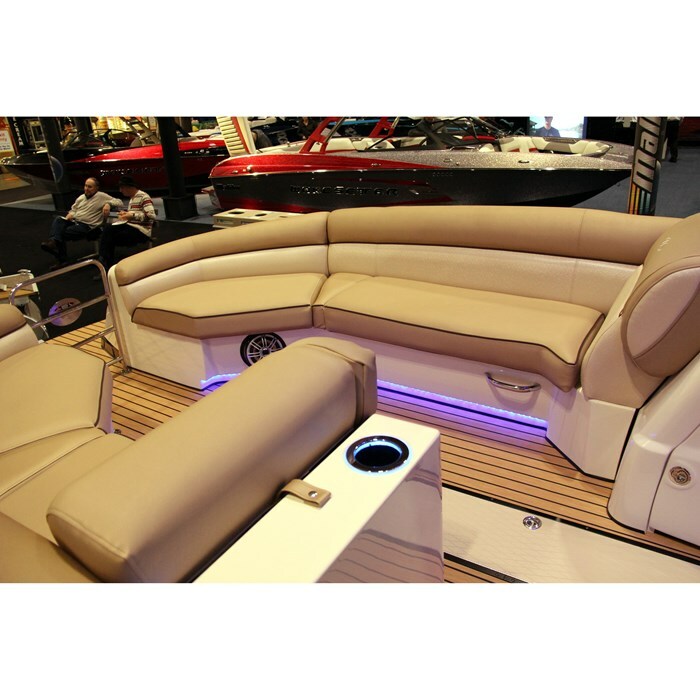 All sorts of custom lighting options are available including on the cupholders, speakers, seat bases, the tower, bimini, underdeck, and underwater. A huge list of flooring alternatives in different areas of the Crowne 250 are available from full vinyl to Berber, Seagrass, Woven Teak, Faux Teak, Woven Seagrass and various combinations of these plus upholstery and accenting colour choices. Polk stereo upgrades are also available plus electronics upgrades at the helm including a Touch Screen with GPS-based Cruise Control. Go all out with a heated helm seat, porta-potti, and a stainless steel propane grill. Leaving perhaps the best option to last, the standard two-tube version of the Crowne 250 can be upgraded with a choice of four progressively more aggressive performance packages. A third centre tube is included with each of these packages and each package progressively enhances this third tube and the other two tubes and adds underdeck enhancements as well along with an increase in fuel capacity. In addition to handling and capacity improvements, what these packages allow you to do is to progressively upgrade your outboard power choice from the base single Mercury or Honda 90 horsepower through a single Mercury or Honda 250, to a single Mercury 350 Verado and all the way to twin, yes twin Mercury 300 Verado’s for a total of a maximum 600 horsepower. Now that’s real power in a 25-foot pontoon boat. The Crowne 250 certainly appears to live up to its claim of a distinctive luxury pontoon with virtually unlimited customizing possibilities.